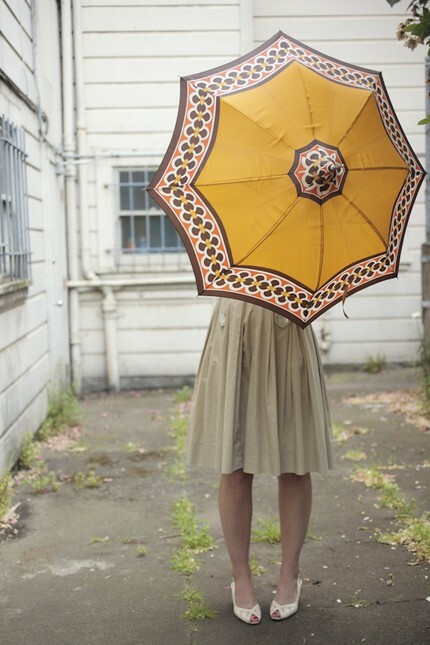 One day I'll splurge on a perfect, pretty umbrella. This one is so sweet, but I just can't stomach paying a lot for an umbrella. Maybe if it attached to the baby stroller and covered us both! Go get it, before someone else beats you to the punch. Animal Head Vintage describes it as "Argh. The cutest umbrella you will ever own" and "The unique pagoda shape is pretty much to die for." UPDATE: My pal & web client, Kerri Silvestri, of Allow Me Events, bought this umbrella for me as a surprise thank you gift!! Pretty much the best gift ever! !